It seems to have sold out at www.zoom.co.uk, www.base.com, www.zavvi.com and www.hmv.com but you could keep checking. Please email DVDSupport@bbc.com with your name and address and either a proof of purchase or photo of the product you have purchased. It may take up to 4-5 weeks to receive replacement discs. BBC Worldwide has announced that Doctor Who: The Collection – Season 12 will be released on Blu-Ray on 2nd July 2018. 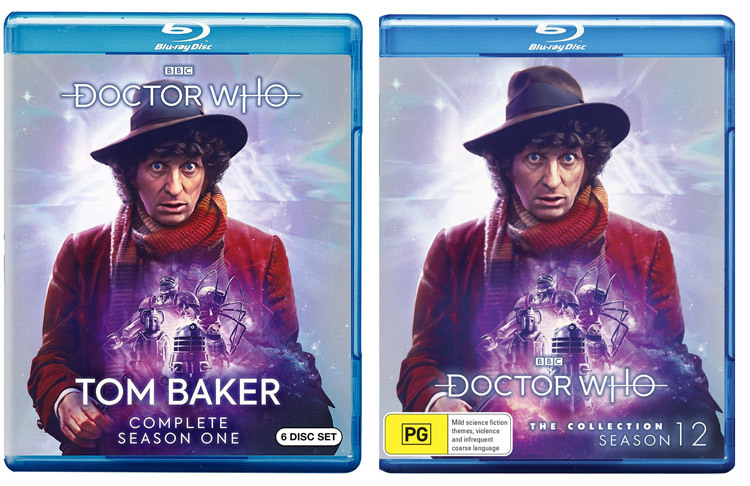 For fans of Doctor Who and collectors of Classic Who seasons, the Blu-Ray has limited edition packaging with artwork by Lee Binding and has been restored and up-scaled to HD by Peter Crocker and Mark Ayres. The new release also has a wealth of new bonus content. Season 12, Tom Baker’s first as the Doctor, features five stories over 20 episodes, including The Ark in Space and Genesis of the Daleks. The Doctor is accompanied in this season by Sarah Jane Smith (Elisabeth Sladen) and Harry Sullivan (Ian Marter) and was first broadcast between December 1974 and May 1975. A candid new one-hour interview with the Fourth Doctor. Doctor Who: The Collection – Season 12 will be released on Blu-Ray from Monday 11th June 2018. You can see all DVD, Blu-ray and Steelbook releases in our Interactive collectors lists. Click Here for The Classic Series List or Here for the New Series List. ADVERTISING SEASON 12 BUT ITS A FAKE. Should I order the region a version? Yes, same on disc contents as the UK set except the Doctor Who – Times documentary but that didn’t even focus Doctor Who funnily enough and is not needed. Locked to Region A NTSC, you need a region free player that plays NTSC. I’d completely forgotten about the replacement discs until a few days ago. I thought, “Oh well, that’s that then. No discs”. Lo and behold, they turned up in the post yesterday! Hopefully with people getting their replacements, Season 12 is due to be re-released. Got my replacement discs today.very easy.an email and a picture then 4 weeks ish later they arrived in post. Easy peasy lemon squeeezy. Thank you bbc. Does anyone know if they’ll get more stock for this or is it the lot? ‘Cause if they make some more, they’ll make an abspulte bomb of profits! Nobody is really 100% sure yet. A couple of people on here have said they emailed the BBC and they replied saying they were not going to be producing any more. Others think there will be a second run. 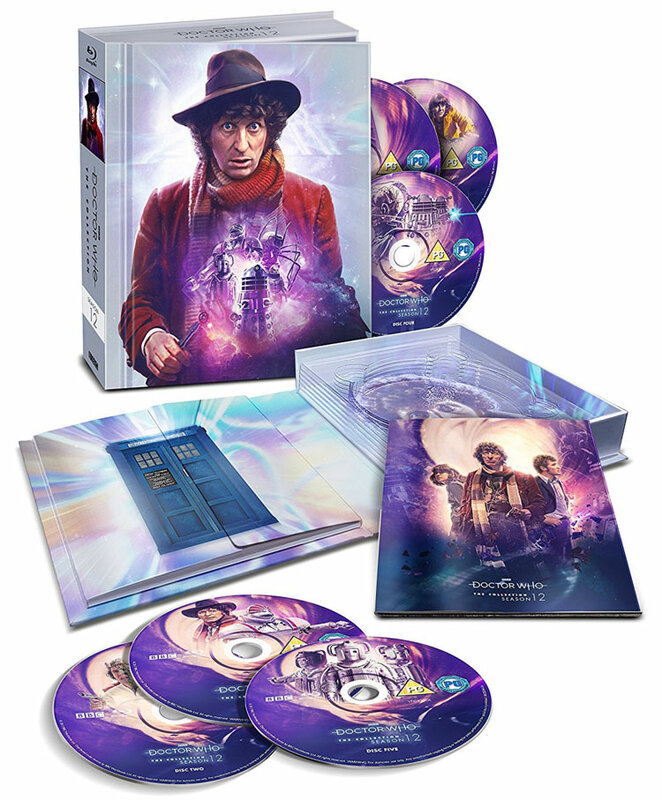 Personally, I think the BBC would be crazy to only make these a very limited run, as there is clearly a demand for the Blu-rays and the BBC could easily sell a lot more. Perhaps the BBC just thinks that physical disc sales are dying out (although, I and many others still buy our films, TV, music on disc). So, they don’t want to keep producing them? Again, nobody is really sure what the Beeb is planning right now. Can anyone give me a UPC code for this U.K. limited edition version? The U.S. version lacks the booklet. Some vendors are using a photo of the limited edition in error, and I would like to confirm what they are selling before buying. Thanks! I received my replacement disc 5 but no disc 3 does this arrive separately or together? That’s strange, I got both of mine together. Might be worth emailing them and seeing what’s happened. I did state in my email that both discs 3 & 5 were the faulty ones. Did you mention that in your email? Got my replacement discs today – didn’t get a confirmation email though. I think it should be noted that if you live in Australia and you want faulty disc replacements, it’s best to just email ConsumerCare@roadshow.com.au because that is where DVDSupport@bbc.com redirected me when they realised I had bought my copy from Australia and that I also lived in Australia. I received my replacement discs for S12 from Sony this morning. Haven’t watched them yet, but have to say the packaging in which I received them was very poor. They were just loose in a box with a small amount of bubble wrap. No clamshell cases, the discs were just loose. They could have easily been broken or scratched in the post. But, grumble aside, at least they’re here now, so I’ll watch them tonight. The packaging was crap but it all turned out right in the end. Now who wants a jellybaby? Got my replacement discs this morning. You’re lucky James. While mine did arrive with bubble wrap the discs weren’t actually wrapped in them so they were just rattling around in the box. Very surprised they didn’t get scratched. Discs are fine though, mistakes have been corrected so all good. 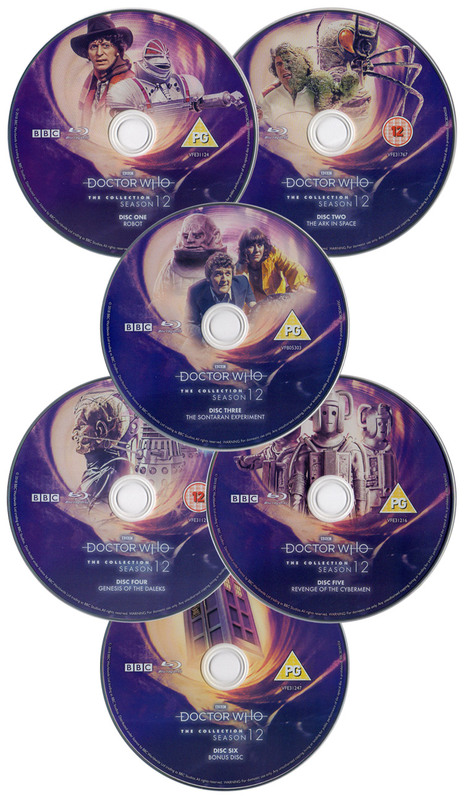 Hey, Gordon, I have just purchased the season 12 box set off eBay for around £100, could I claim the replacement discs? Yes. You should be able to. Are you sure the discs you have haven’t been replaced already? Yeah, he said it isnt included. Thanks Gordan and MJS. I’m sorry, as I am sure this has been asked before (and I did my best to find it). Is there a problem with the mastering on the Australian Blu-Rays. Is so where do I write to to ask for replacements? Thanks in anticipation. Email ConsumerCare@roadshow.com.au with proof of purchase and adress (or photo of set with written adress in view) and they will put you on the list for replacements. Still no sign of replacement discs for season 12… is it worth resending my receipts? It has been considerably more than the 4 -5 weeks wait! No – just leave it as it is. Remember they have thousands to get through so try and be patient. No news is good news that they have your original email. I have to say have loved the blu Ray and the quality is noticeable, I just think it would be nicer in a steelbook this would save so much space on my shelf ! Just got round to looking at my set closely and overall it is nice. I do worry about the quality control on them a bit though as mine certainly has some rough edges in the packaging and we all know about the faulty discs. One question I’ve got though is that does anyone else’s set have a large crease down the middle (about 2/3 across) of the back cover for no apparent reason? I thought it was supposed to be there but there’s actually no reason for it. Is this something that’s on all the sets or has mine been damaged at some point? A crease that goes through the letter B of the TARDIS Police Box sign on mine. Does anyone know if and when this will be released in New Zealand? Also if it is will it have the faulty disc problem? Do you get a reply from dvdsupport when you email them? I ordered from Ivycorp.com. I got a refund from them aswell. Don’t know why, I had a feeling that it may have been dodgy because it was only £25. How long did it take between ordering and refund William? Absolutely nothingnhas been confirmed yet. Seems likely to be 19 next, but that hasn’t been confirmed yet and we don’t have a date. Is there any idea if there’ll be more stock of this? I understand it’s a Limited Edition but I’m not sure if I should wait any longer to pick this up? it really depends of if they just decided to do one run (as they did with the 50th) so when its gone its gone, personally i would get it now if you can. I have a second set on order from Base.com. It says it is due to be dispatched today. I phoned them today to see if it is stock with the corrected discs and they knew nothing about the faulty discs. They said that if i find they are the faulty discs they will accept returns!! Lack of communication somewhere! There is an error during (at least) Part One of Disc Two (The Ark In Space). It’s at 20m 30sec or so… At the point Harry and The Doctor are at the control panel before entering the human chamber. It skips to several seconds later. I’ve tried it on three different blu-ray machines and it’s the same. It must just be on your disc. That’s a significant error for nobody else to comment on, and I just checked on mine and there’s no issue. Are you sure it’s not just your disc? No one else has reported this problem, and I just checked mine and didn’t notice any skipping. How about clicks or pops with the sound? Part 2 at 7:22 and part 3 at 23:49 or so? Clicks, Pops ,Errors, Replacement Discs. This is a fiasco. Tbh, for all it’s perks, this release is a bit of a mess isn’t it? Double-checked again – still the same. Good enough reasons not to spend £40.00 or more on this set. They should have delayed the release even further. Mine is like this as well just have to “tip” them out. what’s the issue with the discs? Sontaran Experiment’s 5.1 Surround Mix got completely messed up and Revenge of the Cybermen has got several visual errors apparently. It’s a widespread problem on this release but the BBC are luckily offering replacement discs to those affected once they’ve ironed out the issues, just a matter of getting touch with them. Sontaran Experiment never had a 5.1 mix. The mono (s that is how they were made) has had to have a stero version, these have been swapped around, so is out of phase, sounding Tinny,or even metalic swirly sounding. Its a simple fix,and one that could have been easily noticed using Automated checking. . But i do agree the release should have been halted and sorted before release. To be fair the BBC do tend to admit and repair (replacement programme) these errors, some are authoring issues, not caused by the Asset management team. There is also a small pdf file missing(one of the retail promotional material pdfs) from disc 6. but this can be added to another release. It would be good if the BBC or whoever posted details of the actual faults they are aware of as the U.S. sets had very simillar faults too. The CGI on Revenge works fine apart from the first glimpse of the Star Striker which seems to be the original effect. I also can hear 2 small clicks or pops on parts 2 and 3 of the soundtrack to The Ark In Space. Otherwise, the set is very nice and I was very surprised how good the overall packaging is. I e-mailed DVDSupport@bbc.com requesting replacement discs with my proof of purchase etc, but aside from a lengthy automated response I havem’t heard anything back. Has anyone had a proper response yet or is it too early to be expecting that/ confirmation of eligibility for replacement discs? Hi, I emailed DVDSupport@bbc.com a couple of days ago with my proof of purchase etc, but aside from a lengthy and kind of unhelpful automated response I have not heard anything back. Has anyone got a helpful response or is it too early to be expecting responses/ confirmation of eligibility for disc replacement? For information on content, potential and forthcoming DVD releases, please contact the DVD Enquiry line dvdenquiryline@bbc.com. We do not sell clips of BBC programmes here. In order to purchase clipped footage, please contact BBC Motion Gallery (www.bbcmotiongallery.com) by e-mail to motiongallery.uk@bbc.com or on 020 8433 2861. If you have contributed to a BBC programme and would like to obtain a copy on DVD, please visit the following link for more information http://faq.external.bbc.co.uk/questions/television/tv_appearance If you want to bring the power of BBC content to your next lecture, workshop, training session, festival screening, or exhibition, please contact BBC active at bbcactive.bbcstudies@pearson.com Please be aware we are only able to supply BBC programmes for institutional use and cannot sell to members of the general public. Prices for non-theatric licenses start at £195 per episode (plus P&P and VAT). Discounts for multiple purchases are available. Further details of terms and conditions are available on our website. To use BBC programmes for entertainment purposes, in environments such as airplanes, trains, buses, ships and hospitals, please contact bbcww.inflight@bbc.com Finally, the DVD Support line does not handle enquiries for licensing of radio material. If you would like to find out more about purchasing radio content, please e-mail susan.hayman@bbc.co.uk (for entire programmes) or motiongallery.uk@bbc.com (for clips and extracts). Please note, we are also unable to provide you with information about BBC TV schedules. Hi Phillip. I got the same response to my initial Query, but today, they asked my to confirm if i had the US set or the uk one (which i would have thought was clear from my recipts. (zoom) But at least they checking which is good.